John P. Farrell, Esq. is proud to announce the publication of his first book, Estate Planning for the Modern Family: A Georgian’s Guide to Wills, Trusts, and Powers of Attorney. The book offers a step-by-step guide to protecting your estate for your loved ones, answers important estate planning questions for you and your family and much more. 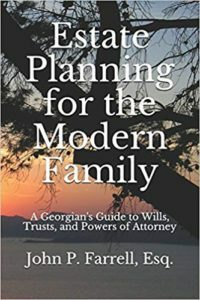 This book will help you learn what is involved with a Georgia Last Will and Testament, why Powers of Attorney are just as important as your Will, and how to plan with advanced estate planning techniques such as Trusts. If you live in Georgia, this book is a must read. Anyone who sets an appointment for a free consultation receives a FREE copy of John’s book. Just reach out to our office, set your free consultation, and you’ll receive a FREE paperback of John’s book, Estate Planning for the Modern Family !! If you aren’t interested in receiving a free consultation and free paperback of the book, it is available for purchase in paperback form on Amazon and on the Amazon Kindle. Estate Planning for the Modern Family is available on Amazon ! !